Duane Lewis (Jérémie Earp-Lavergne) goes into a murderous rage at the sound of music. After killing a girl in New York, he escapes to Montreal, where he tries to escape from his past – and from the music that will cause him to kill again. I’m just going to work on the basis that the low production quality and questionable acting in Discopathe were an intentional part of its obvious homage to late 70’s/early 80’s horror films. And, to be honest, these were some of the best aspects of the movie, which walked right up to the line of being completely over the top. I actually wish they’d gone even further – by really hamming up the acting; and bringing the quality of the film down even more, so it felt grittier than it already did. In true splatter film form, of course, the real star of the movie is the special effects, which seem to have taken up most of the film’s budget. There was blood and gore in (probably literal) bucketfuls, and despite initially laughing at a pretty fake looking hand, I found some of the later props very believable in their fleshiness. Unfortunately, despite appreciating what it was going for, I can’t really say that Discopathe was successful in its story-telling. Even allowing for the fact that this could have been an homage in and of itself, there were some seriously questionable elements to the story, and to the killer’s motivation (if he can be said to have any motivation, that is). There were also inconsistencies in what effect music actually had on him, which made it hard to stay in the moment and enjoy the movie for its silliness. 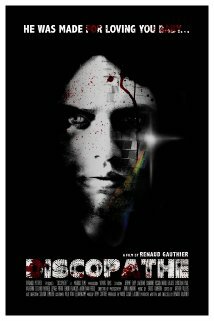 Ultimately, Discopathe is yet another movie that falls into the “it was okay, but…” category for me. It had a lot of potential, but I don’t think it managed to pull it off in the end.